One of the most amazing joys of being a parent has to be the conversations you get to have with your kids. You never know what they're going to come up with next. A lot of times it's just silly - fart sounds, milk snorting, knock-knock jokes and gibberish. But sometimes they say things that give you a glimpse of what's going on in their heads. And in the world. Last night we went to a pizza fundraiser for the band and chorus departments at our school. (Note: Support The Arts!) We were early. It was going to be another 30 minutes or so before my husband could meet us there. So I drove right by the restaurant and turned down another road. "Where are we going?" I immediately heard from the back seat. "We just passed Cici's!" "I know - we're waiting on Dad to get here," I replied. "But where does this road go? What's down here?" my daughter asked again. I had no idea what was down that road. That's why I turned. I had driven by the road thousands of times and always wondered where it went. Here was a perfect opportunity to explore. Turned out to be a rather anti-climactic trip. There was nothing on either side of the road and soon we reached a stop sign. Across from us, on the other side of a chain-link fence, was the very busy I-526 beltline around Charleston. To the left was nothing but pine trees. Another road extended to our right. At the end of the road sat a lonely but impressive looking building. I had seen the building from the highway and often wondered how it was accessed. Now the very minor mystery was solved. "Hey, I've seen that building before," Mary-Margaret said. "What is it, anyway?" "Strayer University. They offer college degrees to people who work and need to go to school at night," I explained. "Oh," she said. "Do you know what I thought it was? I thought it was a school for runaways, you know, 'strayers'. I guess that's kind of stupid." "No," I replied. "That's genius." We all run away from something at some point in our lives without knowing what we are running toward. Wouldn't it be nice to have a place designed especially for us, someone to help us find our way? Not everyone knows right out of high school what they want to do in life. They don't see a clear path in front of them, or maybe they take one and find out it was the wrong road. 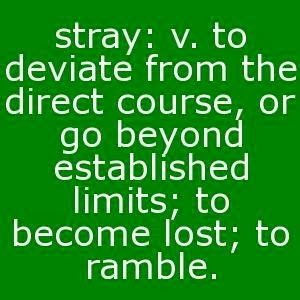 They go astray. Only after they get a few years of hard knocks behind them do they see how important an education is for their future. But by then they might have a job, a family, and other obligations. They can't afford to drop everything and be in school all day. Institutions like Strayer offer an opportunity for regular people who might have lost their way to get on a better path. This road can be longer for sure. But some define success as a long obedience in the same direction. When the road seems winding and even desolate, you keep pressing for the prize at the end. I have no affiliation with Strayer. It just happened to be the school at the end of our brief detour. But the name offered us a second of humor, a slice of insight into my daughter's thought process, and a moment of reflection. I love that my daughter is so hopeful, that she thinks runaways are also running towards something, and that strayers can eventually find the right road with a little help. Even though that isn't where the name of the school came from, it's applicable. Here's to second (and third and fourth...) chances to find the best road.